Well this is easy – it’s a boost pedal made by Fender, simple! Has a couple of uses.. Use it after your overdrive pedal for a searing fat guitar solo boost. Or use it on it’s own to really thicken up your tone for clean lead guitar solo, or use it in front of your valve amp to thicken up your tone and drive those valves harder. 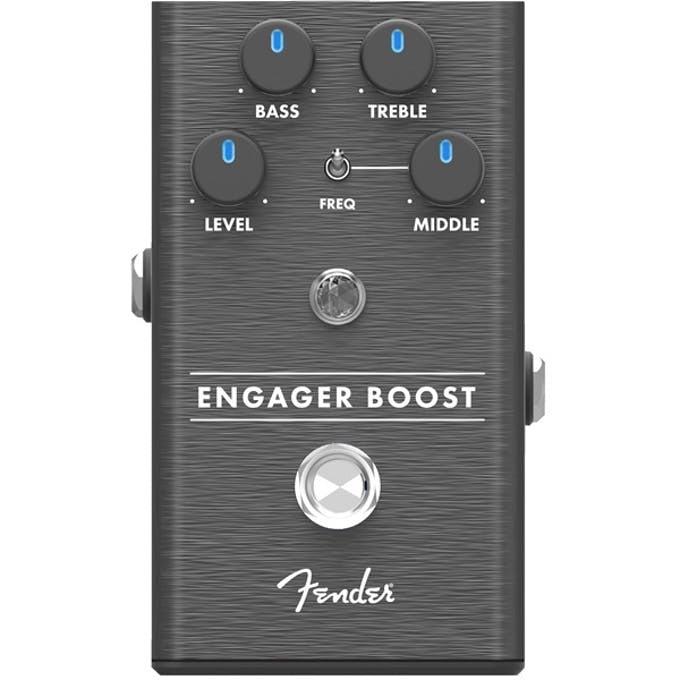 More from Fender on the Fender Engager Boost. Designed by our in-house team of experts, the Engager Boost is an all-original circuit. We consulted with a plethora of players while designing this pedal, and the resulting stompbox is packed with stage-ready features. The chassis is crafted from lightweight, durable anodized aluminum, and the Amp Jewel LED gives your pedalboard the classic Fender look. The LED-backlit knobs show your control settings on a dark stage at a glance. We even made swapping batteries quicker and easier with our exclusive “patent applied for,” magnetically latched 9V battery door.